Hannah Johnson, a junior from South Metro Dance Academy in Lakeville, MN, recently competed her solo in the Talent On Parade national competition in Branson, MO. She won 4th place in the TOP Best Costume Soloist Award. The Line Up is so happy for Hannah! She selected and top and skirt (Wylie) from The Line Up web store www.thelineupstore.com. Her fabric selections were bubble gum zsa zsa, burgundy tricot and lace to complete the look. The finishing detail was adding rhinestones, which further enhanced the sparkle onstage! Thanks to Hannah and SMDA for sharing this award with us, we are so proud! We are thankful for our wonderful and dedicated customers that we have been able to work with over the years. Most recently, we have worked with a team abroad from the United Kingdom! Check out these great pictures of the Sr Line dancers at South Metro Dance Academy in Lakeville, MN. The black velvet costumes with the birdcage veil was a dance to Amazing Grace by Ani DeFranco, a darker version of the song. The rhinestones on the back total around 1,000 stones in 4 different colors that were all done by hand! Our own Director of Customer Relations, Lindsey, is their teacher during the weeknights and created the costume and choreography idea. Check out these pictures that Michelle sent from the Portland Trail Blazer Dancers from their recent games! Check out the University of Iowa Dance Team in their new costumes from The Line Up! They recently went to the Universal Dance Association National Championships in Orlando, FL where they placed 9th in jazz- the highest ever for the program! 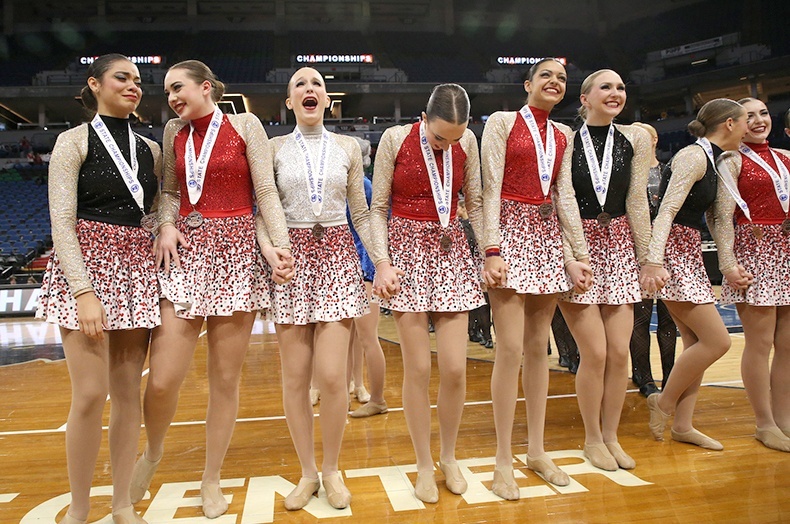 In the Pom category, they placed 7th which is also a huge accomplishment. Head coach, Jenny Eustice, is extremely proud of her team. "The costumes look beautiful out on the floor. We have received so many compliments!" This past weekend, Kristina the MN Vikings Pro Bowl Cheerleader, had a "show off" party of her new tops and bottoms from The Line Up with former Vikings Pro Bowl Cheerleaders before she is off to Hawaii. Here she is with Head Coach Tami Krause's 6 month old daughter Doriana. The Fargo Davies Eagle Elite Dance Team looks great in their new High Kick costumes! Fargo Davies High School was recently built in North Dakota, and The Line Up loved designing their brand new costumes. Thanks to coach Jessie Mattern for sending us pictures. Good Luck to all the girls at State in January! Thank You to Lynn Truitt and Kimberly Kershaw of the Columbus Blue Jackets for sharing pictures of the Pepsi Power Patrol in their new uniforms! The crew stays busy interacting with fans throughout games at Nationwide Arena. Click here to meet the 2010-2011 Pepsi Power Patrol.